Creating a complete games room can be one of the most exciting aspects of your home design. This is a room you are building specifically to have fun, putting the room together and choosing the games you want you, your family and your guests to play is half the fun! When most people think of building a game room in their basement they think of pool tables. While these are an essential aspect of any remarkable games room, remember that only two people can play it at a time. With more guests around you’ll need more games. Choosing the right ones will maximize your space and your levels of enjoyment. One of the most space conscious games you can choose for your gaming room is darts. A dartboard simply takes up the wall space where you mount it and a clear path for the players to throw the darts. 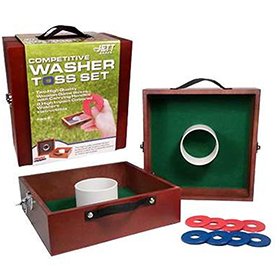 It is a simple game that can keep your guests occupied for hours on end. Bubble hockey is like foosball in that you control players on a hockey shaped rink using rods connected to the players. Unlike foosball though the players slide up and down the rink and spin in a way that imitates hock a real hockey player shoots the puck at a goalie. This is a table that formalizes that most informal of games: beer pong. 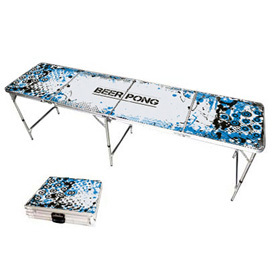 You have your choice of tables – regular and splash edition, and as always there is a steady supply of balls and cups. This game is always sure to start a good time. This game imitates soccer with the players mounted onto spinning rods the move side to side. The object is to kick the ball past the goalie. It sounds simple but the fun is endless! This sport is not just for old people! It is an exciting way to spend an afternoon in a relaxed environment. Grab some sticks and send those biscuits! Ping Pong is a sport that requires lightning fast reflexes, accuracy and cardio vascular endurance. It is a real workout and can be real fun for the 2 players participating. This may just be the most played of all the games available in a games room. When the guys are over why not treat all of them to a properly set up poker table that has them feeling like they’re in Vegas, minus the showgirls of course. Finding the right wall art or the right quirky character statues for your style can really separate your game room for others. Anyone can go out and buy a few games, but getting the details of decoration down can create an environment that relaxes your guests and carries you all far from the office. Ok, so maybe the games room isn’t always about playing games. There are plenty of ways to have fun and the right bar with a few stools can be just what you need to help wind down a night with your friends. Browse the category descriptions above and start planning your games room, or contact us Oakville Home Leisure today and we’ll get in on the fun of helping you pick out the right items.